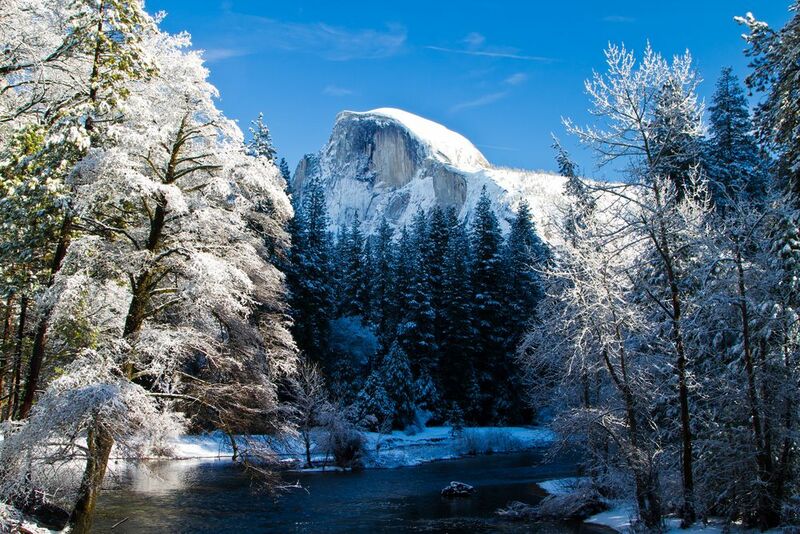 Let us help you plan your winter trip to Yosemite and prepare for an unforgettable experience. With tranquil solitude, fresh powder, boundless mountain landscapes and towering treetops, visiting Yosemite during the winter will make you feel like you’re the first person to ever set foot on the land. There is a wide array of outdoor and indoor activities to take advantage of, and with the added bonus of small crowds you can be sure that a winter weekend getaway in Yosemite National Park will be a spectacular experience. If you like the idea of ice skating under the watchful eye of Half Dome, hiking inside of the park’s mighty sequoia groves (Merced and Tuolumne) or cross country skiing through the meadows of Yosemite Valley – this is the perfect trip for you! Yosemite National Park covers a span of nearly 1,200 square miles in California’s Sierra Nevada mountain terrain. Although the park is open year round, access is limited during winter, especially on the higher elevation roads. Tiogo Road (Hwy 120 through the park) and Glacier Point Road are closed for the winter season, for example. The closest airports are Fresno-Yosemite International, approximately 1.5 hours from the park’s South Entrance and 2.5 hours to Yosemite Valley; Merced Airport, about 2 hours from Yosemite Valley; and Modesto City-County Airport, about 2 hours from Yosemite Valley. The park offers a number of accommodation options – from cozy mountain cabins to luxury hotels and even unheated tent cabins in Curry Village (now known as Half Dome Village). Most of the year round accommodation is located either in Yosemite Valley or southern Yosemite, although you can find a ton of places to stay outside of the park as well as camp sites that are open in the winter scattered throughout. Yosemite’s most luxurious accommodation is the Ahwahnee Hotel (now called Majestic Yosemite Hotel). With a striking granite façade, meticulously crafted log beam ceilings, an expansive dining room and Great Lounge, and a design that reflects the rich Native American history, a stay here is definitely recommended. The hotel was built in 1927 and sits near the base of Half Dome and Glacier Point. Though it’s nearly impossible to get a room here during summer, the less-crowded winter period gives you the rare opportunity to stay in this magnificent hotel. The hotel also hosts a number of events (as well as numerous celebrities guests throughout the years) even in the winter season. Also located inside of Yosemite Valley is the Yosemite Valley Lodge (formerly Yosemite Lodge at the Falls). Though less opulent than the Ahwahnee, it’s located right next to the famous Yosemite Falls – and much less expensive of course. The previously mentioned Curry Village is also a lodging option for those looking for a little less ritz and a little more rustic. Here you can choose from cabins with or without a bath, canvas tent cabins heated or non-heated and a standard hotel room. Luckily for those looking for a quick winter weekend break, the historic Wawona Hotel (now called Big Trees Lodge) is open all season during the weekends. The hotel first opened in 1879 and is conveniently located near the Mariposa Grove (closed for a restoration project until fall 2017, home to the famous Grizzy Giant and California Tunnel Tree) and the Badger Pass Ski area. For those looking that love cross country skiing, overnight trips are available to ski huts and this is a highlight for many. The Glacier Point Ski Hut is a 10.5 mile ski to the hut. You can also take a 10 mile ski into the historic Ostrander Ski Hut. Just be sure to book in advance. The most awesome winter activity in Yosemite is to explore – and there are tons of hiking opportunities all throughout the park. The most predictable trails are walking along Yosemite Valley, Bridalveil Fall, Lower Yosemite Falls, Mirror Lake, Artist Point and the Vernal-Fall-footbridge section of Mist Trail. These routes are almost always open, except with extreme snowfall. Check out the park service’s website for the most up to date information regarding trail accessibility, especially as the elevation increases. Snowshoeing is also a highlight activity during the snowy season at Yosemite, with a wide variety of guided tours, even in the evenings. You can also check out multiday tours such as Yosemite in Winter Tour for an up close and personal extended stay in one of North America’s most astounding parks. 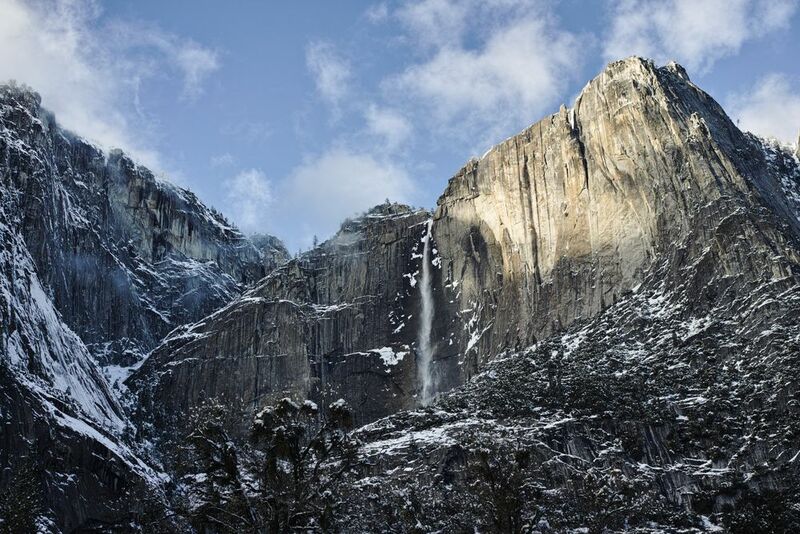 Or have a look at some of the many guided winter tours offered by Yosemite Family Adventures. 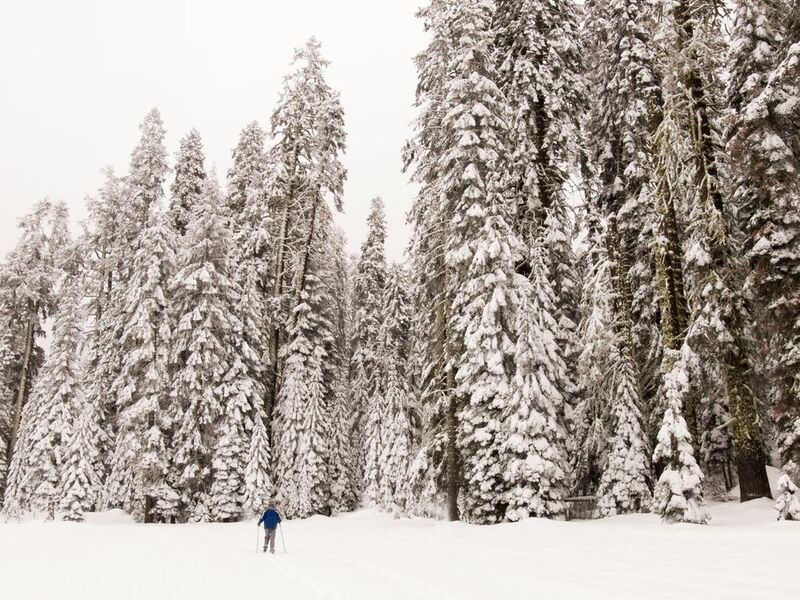 When the first layer of powder falls, Yosemite is also famous for some of the most scenic cross-country skiing routes in the world, providing exceptional views of the park’s most impressive sites. As mentioned earlier, you can do overnight trips to Glacier Point Ski Hut or Ostrander Ski Hut. There are also more than 90 miles of marked trails and 25 miles of groomed track. If you want to practice downhill skiing, then the Badger Pass Ski Area is the place to be for downhill skiing and snowboarding, with a terrain park and mix of beginner and intermediate slopes. Ice skating at Half Dome is also a popular winter activity, attracting visitors since the 1930s. Here you can enjoy fresh ice, skate rentals and a cozy hut to warm up in – with ample supplies to make s’mores! 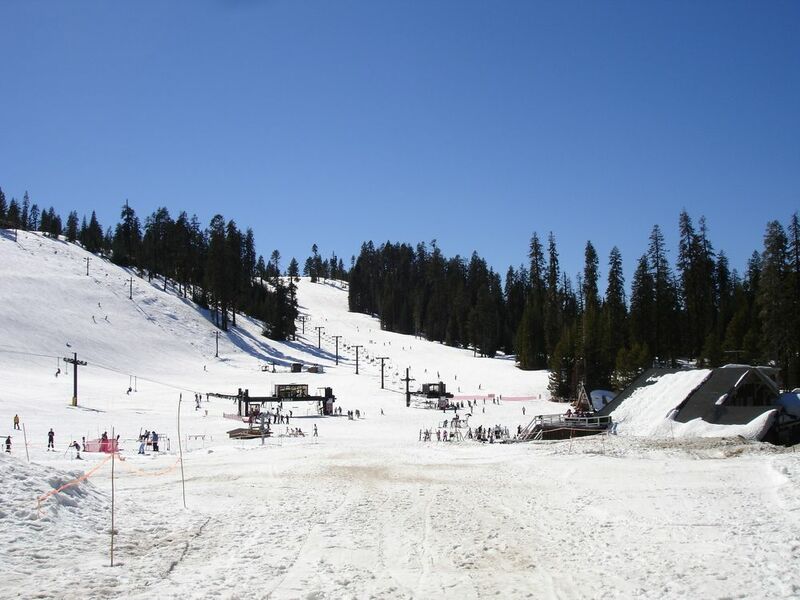 Another family-friendly activity is snow tubing in Yosemite – perfect for people of all ages. But don’t worry – after all the outdoor activity, the park offers plenty of options to refuel as well. Inside Yosemite there are a number of restaurants such as the world-famous (and very fancy) Majestic Yosemite Hotel (formerly Ahwahnee) dining room. For something a little more casual check out the variety of options at the Yosemite Village. As well, there are tons of choices outside the park gates as well. What are you waiting for? 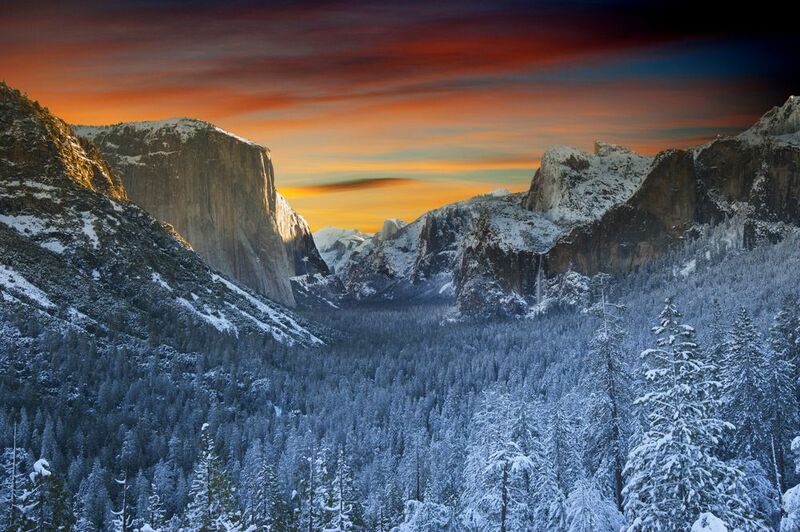 Yosemite National Park is a winter wonderland waiting to be explored. From majestic pines to frozen waterfalls, elegant dining rooms to campground living – and all that’s in between! Winter might be the answer here. Been there during the Summer and it was overcrowded. Did not enjoy the park. Hi Ted, I agree with you 100%, it is very busy in Yosemite in summer, however it can be spectacular in winter. One summer we got stuck in a 1 hour traffic jam trying to get out of the valley before dinner! That said, you can get away from it all in Yosemite in summer as well. We regularly find hikes off of Tioga where we see only a handful of other people! Yosemite is truly one of the most beautiful places on earth. I hope you'll give it another chance!